I didn’t even realize it but it’s been five years since we got our little Alto. Although I’ve already expressed my gratitude when the keys to the compact car had been handed over in 2008, my husband urged me to write a formal post about it. So thank you very much Sitel Philippines and Discovery Suites Pasig. I was barely a new employee at Sitel Baguio during the last quarter of 2007 and I was freshly introduced to the production floor when I won the major prize for Sitel’s anniversary/Christmas celebration that year. Not only was I new to the company, my name was picked during a random digital raffle amongst thousands of Sitel employees throughout the country. All eyes were on me at that time; some were vicious in envy considering that I was a noob employee. I still recall how one of my teammates joked that they have been working in Sitel for 7 years and didn’t even win a rice cooker. Months ahead, it was already announced that a car is at stake for Christmas. 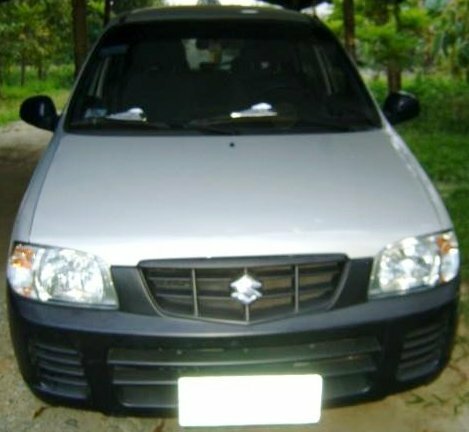 It was a blue Suzuki Alto which was on a spread at Sitel’s newsletter/magazine. But I was awarded with a sleeker silver one instead. Blue or silver (I like the silver better even if blue is one of my favorite colors), I thank Sitel Philippines nonetheless. Aside from the car, I’ve also earned thousands in terms of incentives the following Christmas; one of which includes a onetime Php50,000 for a customer referral program. I wrote about these in the post What I Miss in the Call Center Life. As for Discovery Suites, they actually sponsored the major raffle award or probably even more. I believe they purchased the car, from what I’ve heard. Why? Most likely, because all foreign executives visiting Sitel’s sites in the Philippines check-in at this hotel in Ortigas. Hence, it is similarly a means for the hotel to show gratitude to Sitel. I got the keys to the car at Discovery Suites and I thank them for that amazing raffle prize award. I’m definitely not the only one to win a car in a call center. There are several others in different companies. There are also consistent bonuses or incentives awarded based on attendance, performance, and more. Although the call center life is very demanding, I’m sure that the perks (which you wouldn’t normally experience in other work industries) are encouraging enough. But this post isn’t about recruiting call center agents is it? ;) Yes, once again it’s about saying thanks to Sitel Philippines and Discovery Suites Ortigas, Pasig.